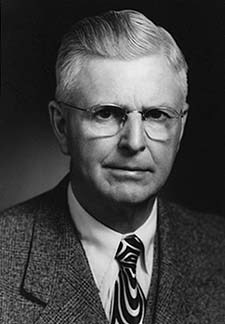 Eldon Elsworth Hinshaw1,2,3,7,8,9,10,11,12,13,14,15 [Elmer E. Hinshaw14,16]. Word reached down Monday this week that Eldon Hinshaw and Miss Verna Ingram had been married the Sunday previous at the home of the bride's parents in White Salmon. Their local friends have been looking for this stunt for some time, and Eldon has found plenty of inquiry as to the approaching nupitals. The wedding was a very quiet home affair, only a very few immediate friends and relatives being present. The young couple are spending a few days in Portland the fore part of this week and will return to this city, where they will make their home in the future. Both are well and favorably known in this city. They have a host of friends who wish them every happiness and success in this life. Mrs. Hinshaw is interested in the Hinshaw & Warwick cafe, which has been doing a good business and has won them many business friends since they started the store. 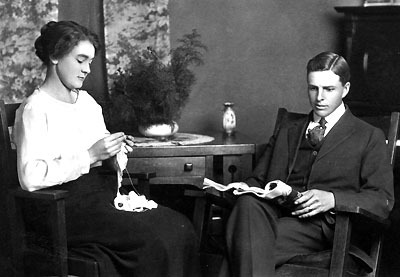 Elmer T. Hinshaw, of Goldendale, and Mrs. Verna Ingram, daughter of Mr. and Mrs. N.A. Ingram, of White Salmon, were united in marriage Sunday last, the ceremony taking place at the home of the bride's parents. They will make their future home in this city, the groom being a partner in the confectionery store of Hinshaw & Warwick. Hinshaw, Eldon, head-of-household, age 28, born in Washington; parents born in Washington [sic]; occupation: farmer. 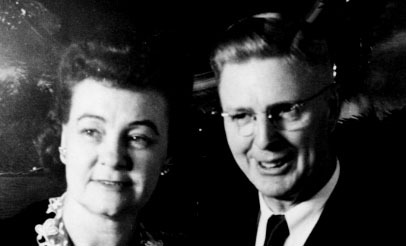 Hinshaw, Verna, wife, age 26, born in Oregon; father born in Kansas; mother born in Illinois. 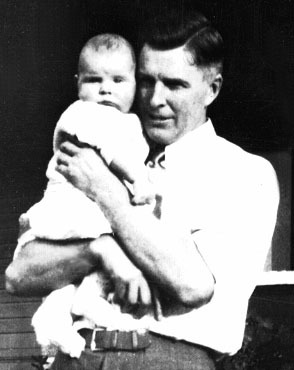 Hinshaw, Duane Eldon, son, age 3 years 6 months, born in Washington; father born in Washington; mother born in Oregon. Hinshaw, Barbara [middle name unclear], daughter, age 2, born in Washington; father born in Washington; mother born in Oregon. Hinshaw, Eldon E., head-of-household, age 38, born in Washington; parents born in New Jersey [sic]; first married at age 23; rented home ($25 rent); radio in home; occupation: manager, grocery store; not a veteran. Hinshaw, Verna E., wife, age 36, born in Oregon; father born in Kansas; mother born in Illinois; first married at age 20. Hinshaw, Duane E., son, age 13, born in Washington; father born in Washington; mother born in Oregon; attended school. Hinshaw, Barbara M., daughter, age 12, born in Washington; father born in Washington; mother born in Oregon; attended school. Hinshaw, Twila F., daughter, age 4 years 10 months, born in Washington; father born in Washington; mother born in Oregon; attended school. Hinshaw, Eldon E., head-of-household, age 48, born in Washington; completed 4 years of high school; on Apr 1 1935 was living in the same place/city; owned home ($4000 value); occupation: owner, grocery store. Hinshaw, Verna, wife, age 46, born in Oregon; completed 4 years of high school; on Apr 1 1935 was living in the same place/city. 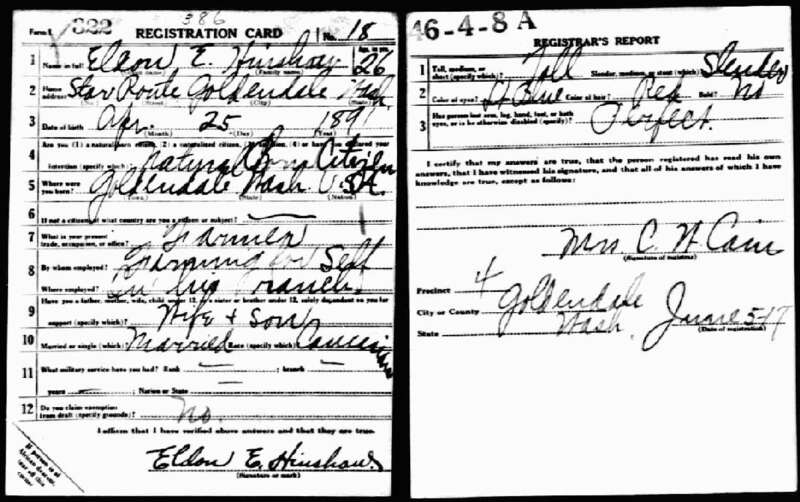 Hinshaw, Twila, daughter, age 14, born in Washington; completed 8th grade; on Apr 1 1935 was living in the same place/city; attended school; occupation: clerk, grocery store; worked 3 weeks in 1939; $27 wages in 1939. Hinshaw, Ingram, son, age 10, born in Washington; completed 3rd grade; on Apr 1 1935 was living in the same place/city; attended school. Mandhaw, Peggy, boarder, age 15, born in Washington; completed 1 year of high school; on Apr 1 1935 was living in the same place/city; attended school. 1920 census, Goldendale Township, Klickitat County, Washington; roll T625-1932, ED 104, page 14B, line #56, dwelling #3, family #2. 1930 census, North Ward, Enumclaw, King County, Washington; roll T626-2490, ED 276, page 5A, line #23, dwelling #92, family #92. Barbara M. Hinshaw birth record. 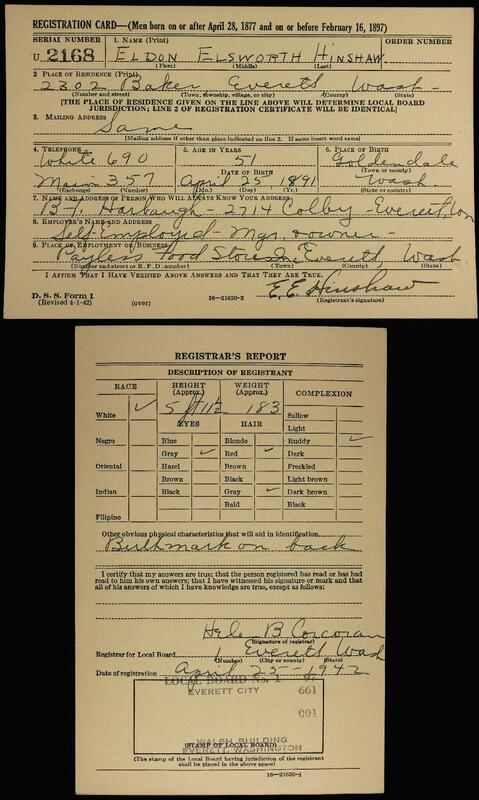 1940 census, Everett, Snohomish County, Washington; roll T627-4359, ED 31-71, page 3A, line #21, household #59. Contribution from Duane Eldon Hinshaw. Contribution from Caprice Hinshaw Kutz.